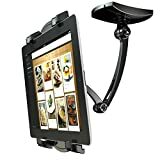 You are here because you wish to get the best tablet wall mount for your ipad, tabley, or E-reader. We are fully aware that choosing the right heavy-duty and sleek looking table wall mount can be a challenge. 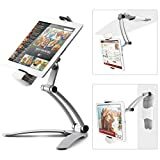 That is why we come up with this curated list of the top 10 best tablet wall mounts in 2019 to help you out. The very first recommendation from us to modern tablet users goes to CTA Digital Tablet Wall Mount. The speciality of this sleek mental tablet wall mount is the 3 flexible hinges and the ball socket that provides 360 degree rotation. More than this, this product is also attached with the cable routing grip clip, for keeping the charge cable in place. This space saving tablet wall mount has the dimension of 18” x 6” x 2”, which means it can hold 7-13 Inches tables easily. Please take note that the whole product package includes an articulating wall mount, a tablet holder, mounting hardware and a cable grip clip. Our second recommendation is the Ipad Wall Mount, the Impact Mounts Universal Detachable Tablet Wall Mount. One function of this is it can attach Ipad/tablet to the wall easily. This Ipad wall mount uses screws and strong ABS plastic, which seem to be the most secure way to keep the Ipad/tablet in place. Additionally, it can enable the 360 degree rotation, which you can effortlessly change the view from landscape to portrait and vice-versa. This Ipad Wall Mount can grip the Ipad/tablet of 8.9-10.4” without a problem. If you are looking for a combination of aesthetics, functionality and affordability in a wall mount for tablets; Koala Wall Mount Damage-free Universal Dock would be your best answer. Besides its beauty, this table wall mount’s also easy to use since it allows wide compatibility. With its heavy-duty strips, the tablet mount is perfect for storing, charging and viewing your tablet anywhere around your house. 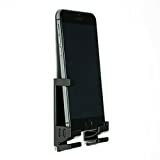 One special note about this is if you wish to keep your device irremovable, you can set Koala Mount bracket to lock the device. Here comes the 2-in-1 tablet holder which can be both a wall mount tablet holder and a tabletop stand. This sturdy and stylish wall mount tablet holder is well made from the aluminum. With the feature of secure and adjustable design, it can hold a 7-12 inches E-reader, tablet and ipad at ease. Last but not least, this wall mount can be rotated easily as it is equipped with 360 degree rotating holder. Plus, the price is unbeatable, too! This absolutely fantastic tablet mount can be used with all large tablets ranking from 8.9 to 18.4 Inches in screen size. This product also has supporting legs, which provide additional support to the bottom of the holder. Besides providing the sturdiness, it also allows 360 degree rotation. Please note that the company of this product is willing to provide all the valuable customers the 2-year limited warranty. This Damage-Free Wall Mount & Dock works with various smart phones and tablet series. With the damage-free and hassle-free feature, your device does not need any extra protection or case. The wall mount can be installed in less than 2 minutes so if you are worried about complicated installment issues, choosing this product will be the right choice. Another special thing about this product is that your device can be charged while docked. Plus, it has the built-in cord clip at the bottom of each bracket. Our top 4th recommendation goes to Koala Damage-Free Tablet Wall Mount Dock. Since this product is equipped with Damage-Free 3M Command Adhesive Strip, it can hold up to 5lbs, which equals to 2.25kg, without the use of screws or holes. Dock and undock, portrait or landscape are your choices, this product can be used based on your preference. One special function of this stylish product is it has the built-in cord clip and the full access to every button and port. 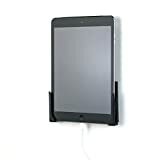 With such versatility, we bet you will want this incredible wall mount for your ipad, tablet and E-reader. Here comes our top 3rd recommendation, the 2-in-1 Kitchen Mount Stand. With the dimension of 6-8.75 inches wide, it is capable of holding all types of slim electronic devices ranging from ipads to surfaces. This product has 2 mounting bases so it is easy to install on the wall or under the cabinet. Lightweight aluminum is the core material of this stylish, flexible, and 360 rotatable mount stand. Please also take note that this 2-in-1-kitchen mount stand can either be attached to wall or stand upright on the counter surface. 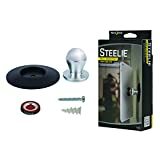 If you order this product, the package will come with an aluminum stand, adjustable tablet holder, mounting bases and a set of hardware. Another tablet mount of sleek design in our top 10 recommendation goes to Kitchen Tablet Mount Stand 2-in-1 Kitchen Wall / CounterTop. It has the excellent compatibility of holding the majority of the 7-13 inches tablets. Since it is well made by the top grade heavy-duty brushed aluminum based, it provides a sturdy hold for your tablet. So you do not need to worry of your tablet tipping over. Moreover, it has the a special bottom designed for 360 degree adjustment. After hearing many recommendations from us, here comes our top 1 in the list. This stylish wall mount product, with the dimension of 2.8 x 1.7 x 2.8 inches, is attached with drywall anchor and screw. More importantly, this product is well made by magnetic tablet socket with the neodymium magnet and silicone center. Since it includes 3M VHB adhesive, the surface is strong and secure; however, it can also be removed without damaging surface! Many awesome features have been mentioned already, make your decision right now. We have just walked you through the top 10 Best Tablet Wall Mounts in 2019. With its individual uniqueness, we do hope you have found the tablet wall mount that suits your preference most. Wait no more, these awesome tablet wall mount are waiting to be yours!